MANILA, Philippines - The National Police Commission (NAPOLCOM) officially released results of April 2017 Philippine National Police (PNP) entrance on Tuesday, June 20. As announced, a total of 2,026 or 7.63% out of the 26,561 examinees passed the exams. 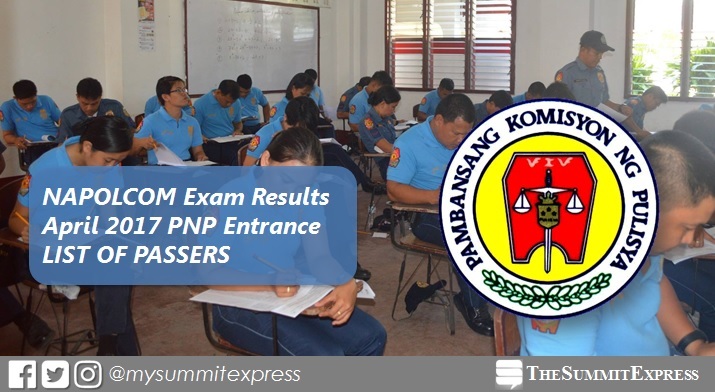 “The immediate release of the results of police exams is in consonance with the Commission’s commitment with the PNP and the Department of Budget and Management (DBM) to make the examination results in synch with the police recruitment process,” NAPOLCOM Vice-Chairman and Executive Officer Atty. Rogelio T. Casurao said. 17-04-1607517, CORNEJO, RALPH JANNRY . 17-04-1609525, GUEVARRA, JHON PAULO . 17-04-1607896, ORDAS, MARY FRANCE . 17-04-0608194, UNGSOD, MICHAEL ANGELO . According to Casurao, the overall passing percentage rate of 7.63% in the PNP entrance examination is significantly lower compared to last October 16, 2016 exam passing percentage of 11.57%. “The low passing rate in the entrance exam may be attributed to the Commission’s continuous upgrading of standards on its police examinations in line with its sustained effort to professionalize the PNP by ensuring that only the best and most qualified individuals are admitted in the police service,” Casurao said. The PNP entrance examination is consists of questions on general information, verbal reasoning, quantitative reasoning and logical reasoning. In the same period last year, a total of 2,705 out of 22,541 (12%) passed the PNP entrance exam. In the October 2016 exams, 2,946 or 11.57% out of the 25,462 examinees hurdled the examinations. Atty. Casurao said that the list of successful examinees will be posted at the NAPOLCOM central office located at the DILG-NAPOLCOM Center, NAPOLCOM Bldg., Edsa Corner Quezon Avenue, West Triangle, Quezon City, and can be viewed at the NAPOLCOM website at www.napolcom.gov.ph. Individual reports of rating will be mailed to all examinees. Verification of test results will be entertained at the NAPOLCOM central office and its regional offices nationwide in July 2017. The PNP ENTRANCE EXAMINATION is open to all Filipino citizens who meet the age, height and educational requirements as provided in the PNP Examination announcement.